Lawyers of jailed former police bosses shun court. Nixon Agasirwe, senior Superintendent of Police and his group at court. File Photo. The lawyers of the nine people, among whom are five top police officers who are facing charges of being in unlawful possession of ammunitions and kidnap of three Rwandese nationals have on Tuesday shunned court. The accused, among whom are five top police officers had appeared before the General Court Martial for the hearing of their case. However, state prosecutor Maj. Rapheal Mugisha told court that he cannot give an update regarding the case in the absence of defence lawyers who have now not shown up for the last two sittings. The suspects, who also include Rwandans and Congolese nationals, are accused of conspiracy with a neighbouring country to kidnap refugees in Uganda, who are perceived to be opponents of their home government. Agasirwe and the group are being represented by lawyers Caleb Alaka, Evans Ochienge and Frank Kanduho, who sent no communication to court explaining their absentia. The court’s chairman Lt. Gen Andrew Gutti has ordered the accused to make sure that they communicate the next adjournment date of June 26 to their lawyers. 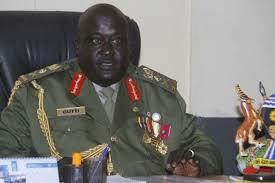 Lt. Gen Andrew Gutti, the chairman of the Court. The Army investigative wing (CMI) states that on the October 24, 2017 at Najeera within Kiira division in Wakiso district, the seven police officers together with two civilians were found in unlawful possession of four grenades which are ordinarily a monopoly of the UPDF. Further investigations also revealed that the 7 police officers allegedly Kidnapped Joel Mutabazi and Jackson Kaleemera on October 27, 2013 at Kamengo in Mpigi district. The police officers who were top aides of the former police chief Gen .Kale Kayihura have been now sent back on remand at Makindye Military police barracks and Luzira prison respectively where they have so far spent ten months since their arrest in September last year .